Do we still really have “free speech”? Wonder what the author of the Declaration of Independence and our third president would think of today’s “political correctness”? The reason I bring this up is that free speech is often denied in America nowadays — almost always when it’s conservatives or the people who call themselves “White Nationalists” who are attempting to speak. The most recent case in point is the intimidation and disruption directed against American Renaissance, one of those White Nationalist organizations, to try to prevent the group from holding its semi-annual convention. American Renaissance, or AmRen, as we bloggers call it for short, had scheduled a three-day conference Feb. 19-21 at a hotel in the Washington, D.C. area. A number of racial realist speakers were scheduled. The founder of AmRen, Jared Taylor, posted announcements on his website giving the dates and location and inviting sympathizers to make reservations. This was a rather naive mistake, I think, because the real haters — the radical Left — monitor such websites to try to disrupt their activities as often as possible. Soon the hotel where the conference was scheduled began receiving threatening phone calls, telling them AmRen was a “racist” organization that had no right to meet, and threatening various things up to and including physical violence if the hotel allowed the conference on its property. The hotel managment quickly caved in and cancelled the reservations AmReners already had made. Taylor made arrangements with another hotel in the area — and another, and another, and another — explaining the situation to each one and being assured by each in turn that AmRen’s right to peaceably assemble wouldn’t be denied. But each time, the Leftist disrupters managed to find out, begin their hateful contacts with the hotels’ management, and force more cancellations. Hotel employees reportedly were afraid to be on duty that weekend for fear of what the Loony Left might try to do, on the scene, to disrupt and wreck the conference. Finally Taylor had to post an announcement on the website, on Feb. 16, that the conference had had to be canceled because all five hotels backed out from commitments they had made to him. But he reckoned without his followers, who e-mailed him by the score to let him know they would be coming to Washington anyway. So despite the Left’s most brazen attempts, AmRen managed to hold a — admittedly truncated — conference somewhere in the Washington, D.C. area. Taylor has not divulged just where, and I hope he doesn’t. The conference in two years almost certainly will be held in some more accommodating part of the country — the South, the Midwest, or perhaps Utah. Unless you’re an AmRener, or possibly a frequent reader of various conservative websites, you probably never heard of the conference fiasco or indeed of American Renaissance. Well, you’ve heard now. Free speech in a free society should be just that — free. No “heckler’s veto” should be tolerated — screaming accusations of “racism” and “hate” shouldn’t be a justification for denying people the right to express their views. Just imagine if a conference of the NAACP, or the Black Muslims, had been driven out of its intended site by White Nationalists — can you imagine the national furor that would have resulted? But when the side denied its say is on the Right, the MSM avert their faces and their voices in — perhaps embarrassment, more likely tacit agreement with the saboteurs. Sure we have FREE SPEECH. . . as long as it’s not in criticism of the Democrats or Liberals. Amen, brother. We’re on the same page there. You might add, “or blacks.” Thanks for the comment, Mr. Horner. I would urge all of our friends to sign on to NEWSVINE.COM and take part in adding their comments under the news stories. It only takes a minute or two, to sign up, costs nothing. . . and is an excellent vehicle to get our message out. You do need to be careful, the liberal moderators are very much pro-Obama but I have been “over-zealous” in pointing out the cost of illegal immigration; the horrendous amount of minority perpetrated crimes — by Blacks and Latinos; our two largest minorities. This is Jared Taylor, editor of American Renaissance. Thank you for writing about this serious assault on free speech. The mainstream media have almost completely ignored these events, which shows how shallow their commitment to free speech really is. There is a small point I would like to correct: we contracted with four hotels to hold the conference, not five. Still, as you note, all four crumpled in the face of pressure and threats of disruption from lefties. We no longer live in a free country. Mr. Taylor, I’m very honored that you not only read my column, but posted a reply. I read your blog and post frequently on it, and have always held you in great esteem as a man who will speak the truth, even when it displeases a lot of people. Please keep up the good work with American Renaissance and your other endeavors. And I am sorry about my mistake on the number of hotels who let you and the AmReners down. Hopefully at the conference in 2012, there won’t be ANY who do. 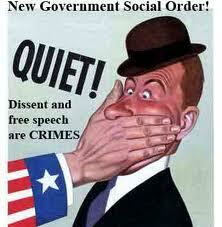 Of course, we have freedom of speech, as long as it is politically correct speech..